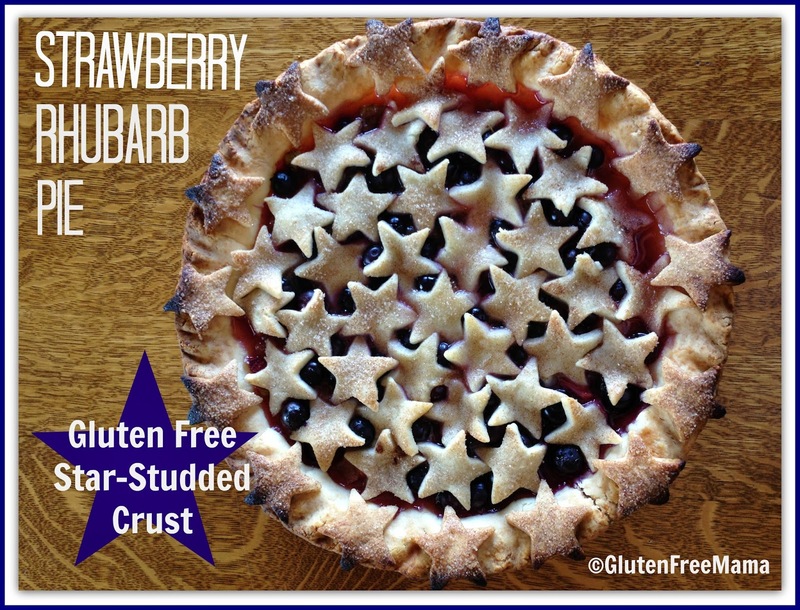 Gluten Free Strawberry Rhubarb Pie with Blueberries and Star-studded Crust! 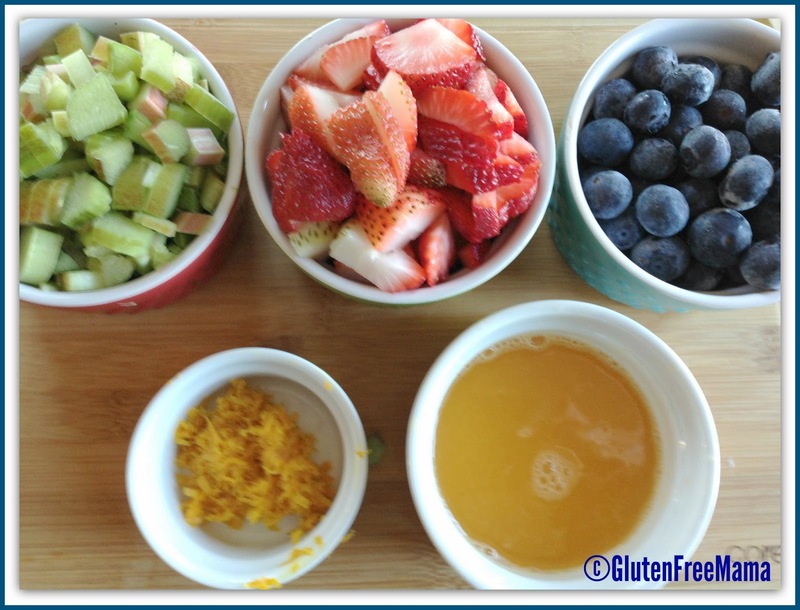 Need a patriotic, Red, White and Blue, recipe to take to your holiday party or picnic this weekend? 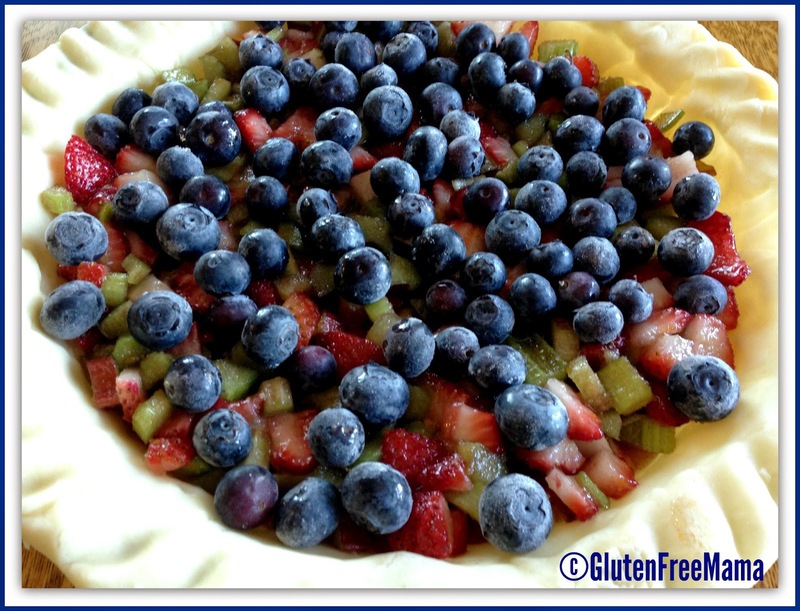 Try Mama’s Gluten Free Strawberry Rhubarb Pie with Blueberries. 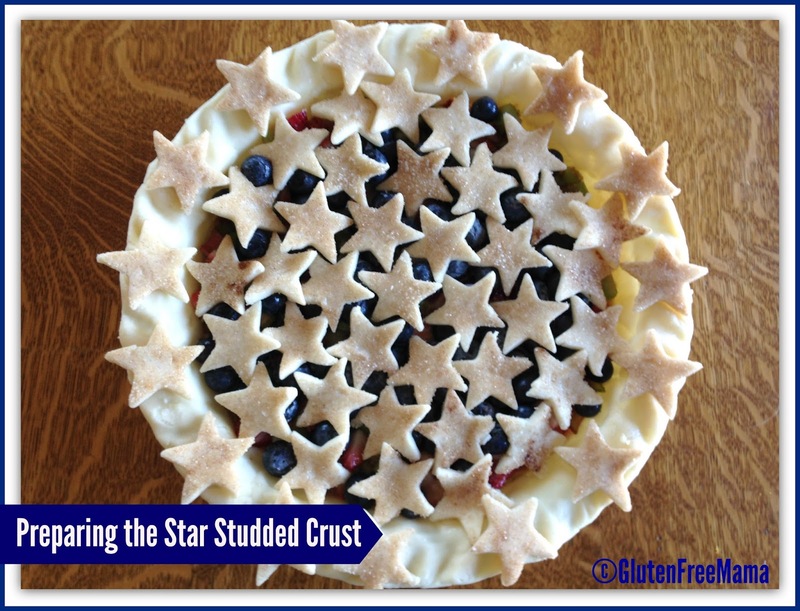 Mama’s makes this extra special by topping it with cut-out pie dough stars for the topping. It’s easy to make, makes the house smell fantastical, and will surely entertain and impress your guests. Prepare pie crust as directed on bag. Roll out half of dough to about ¼ inch thickness, between two pieces of wax paper lightly sprayed with cooking spray. Remove top layer of wax paper. Flip dough over and press into pie pan getting it into all the corners. Then gently remove top layer of wax paper. If you have tears or gaps in the dough, don’t worry, use the extra dough from over hang and press into gaps. Cut excess dough around the rim of the pan leaving about ¼ inch over hang. 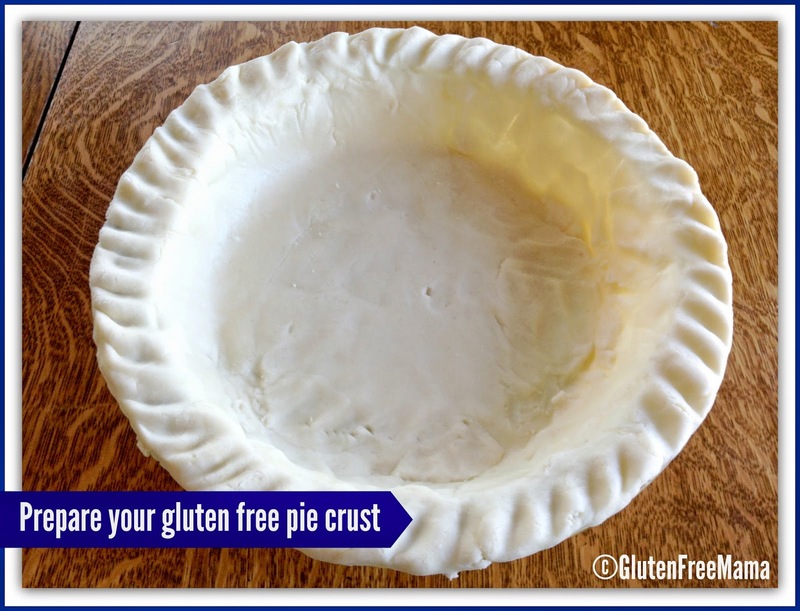 Fold the ¼ inch over hang under and flute the crust around the rim, making a nice design. In a medium bowl, combine rhubarb, strawberries, sugar, zest, orange juice and gf flour or cornstarch. Mix well to combine. Spread evenly into pie pan. Sprinkle blueberries evenly over the top of strawberry rhurbarb mixture, allowing them to rest on top, without mixing them into the mix. 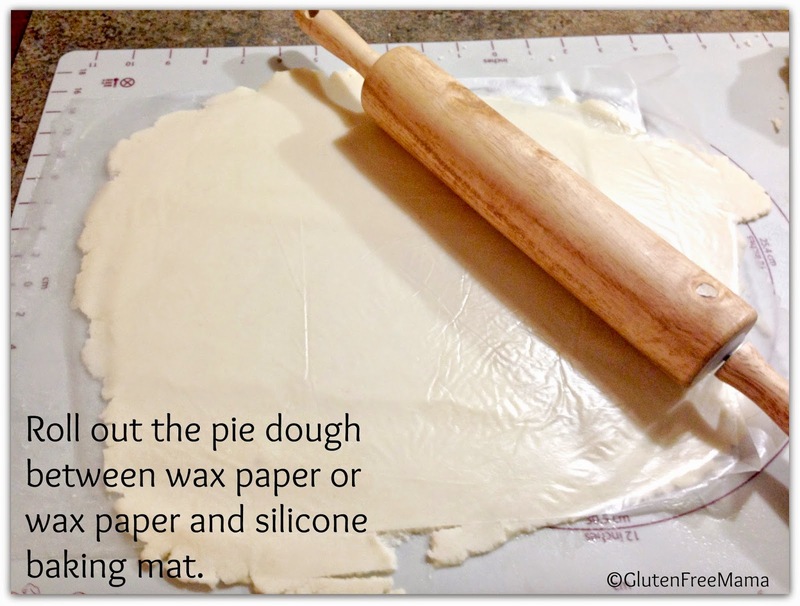 Roll remaining half of pie dough between two piece of lightly sprayed wax paper, again to about ¼ inch thickness. Remove top layer of wax paper. Baste the top of the dough with egg white wash. Mix the ¼ cup sugar the ¼ tsp. cinnamon. Sprinkle evenly across the dough. Cut out stars with your mini star cookie cutter. Place stars on top of pie filling starting in the center and working your way to the outside. Place the stars fairly close together. Then baste the edge of the pie around the rim with egg white wash, so that the stars will stick to it. Cut out more stars. Baste the bottom of the star with egg white wash and then place all round the rim of the pie. Place in 400 degree oven on center rack in oven. Set time for 20 minutes. Then place a ring of foil around the out edge of pie to prevent the stars around the rim from burning. Bake for another 20 minutes. Then place a piece of foil over the top of the pie to prevent overbrowning. Finish baking for another 20 minutes. Total baking time is 60 minutes. Allow to cool completely. EGG FREE: If you are egg free you can baste with warm water instead of egg white wash. It will still work, just won’t give it that shiny look and sugar might brush off slightly. GFM Tip: Before juicing orange, zest the entire orange. Save the excess orange zest in a Ziploc bag in the freezer for later use. GFM Tip: Do you have rhubarb coming out of your ears? No worries. Just wash it up good, and then cut into ¼- ½ inch pieces and place in large freezer safe ziplock bags and store in freezer to use in recipes all year round.